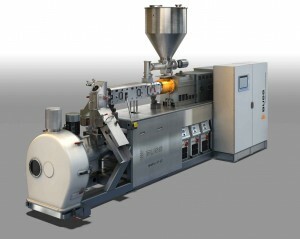 Pratteln (Switzerland), September 2013 – Starring at the K 2013 trade fair this year (October 16 to 23 in Düsseldorf) will be the new BUSS quantec G3 compounder for processing polyvinyl chloride (PVC) into high grade pellets. This third-generation version of the high-performance BUSS quantec Kneader series features further improvements including a bigger processing window, greater throughput, and still higher product quality. BUSS has also managed to reduce not only the investment cost of this machine, but also the specific processing costs. The quantec G3 incorporates twelve years of BUSS 4-flight technology know-how and experience. Its key mechanical and technological features are the longer process section, now extended to 14 L/D (L = process section length, D = screw diameter) – for better mixing and greater throughput – and the larger intake zone diameter. Smooth transition to the smaller mixing/kneading zone diameter is facilitated by tapered liners according to specific product requirements. Furthermore, the outer screw to shaft diameter ratio has been increased to 1.62. This increases the available throughput volume at constant speed. A key distinguishing feature of the quantec G3 with regard to product quality is the patented design of its screw flights. Their optimized free-form surface geometry ensures a constant shear gap between the flights and kneading pins – over the entire length of the screw flight. This geometry plays a decisive role in particularly gentle kneading and mixing, by maintaining constant shear force on the product and thereby eliminating any risk of local overheating. The segmented mixing and kneading screw is freely configurable: various conveying, mixing and kneading elements can be installed on the shaft according to PVC compound quality requirements.The quantec G3 is delivered as a turnkey compounding line. This is the first BUSS Kneader to incorporate a fully optimized feed system upstream, and downstream a throughput-optimized single shaft discharge extruder with pelletizer. Heating/cooling units for the mixing/kneading zone and discharge extruder are built into the machine and fully piped, as well as electrical heating for the other zones. The control cabinet is mounted directly on the machine, and is fully wired and tested before leaving the works. This saves several weeks of on-site manpower for installation and commissioning – only the power, water and compressed air supplies have to be connected. The quantec G3 is state-of-the art for all PVC-compounding needs and user requirements. BUSS not only sets a new technological benchmark thereby for this heat and shear sensitive product, but also lowers the cost threshold for compounding lines.